If you are thinking of renovating or remodeling an existing bathroom, I encourage you to think about these suggestions. Are you someone who loves everything farmhouse, has never missed an episode of Fixer Upper and could not pass up a great vintage find? Or maybe you are the opposite, find Chip Gaines super annoying, and don’t see the big deal with this trending style? Or maybe you are somewhere in the middle? Whichever way you lean, adding a touch of farmhouse style to a bathroom can give it more warmth and personality but not completely change the look. I personally love the style and its modern take on a farmhouse. But many of us live in homes that may not lend themselves to the farmhouse style. We live in homes that are traditional, contemporary, cottage, mid-century, and modern. We live in townhomes, city homes, high rises and condominiums. But we can add small farmhouse touches without going cray cray and shiplapping our entire homes. Let’s face it, completely changing the interior style of a home is not easy, cheap, nor recommended but adding small touches is definitely a welcome change! Our home is a french country styled house. I look for ways to add that modern farmhouse and country touch without completely changing the style and structure of the home. 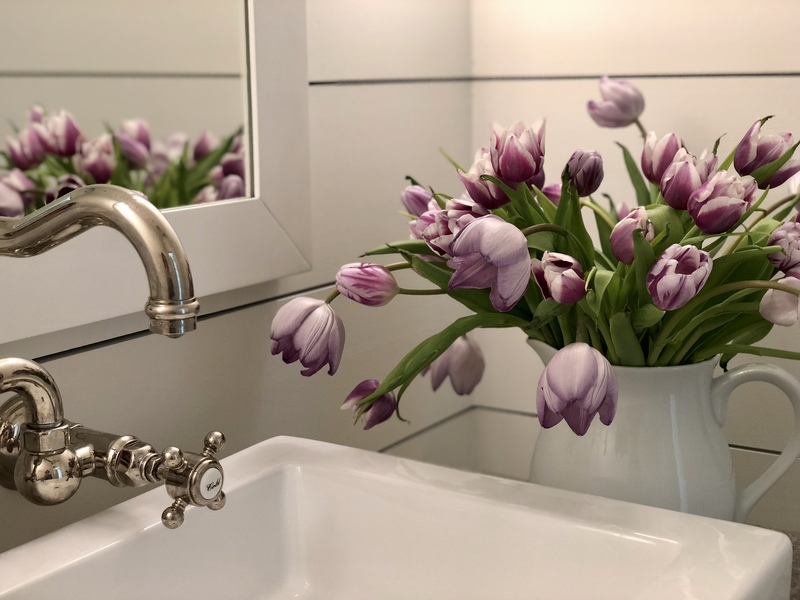 When we remodeled our powder room, we added more than a “bit” of farmhouse style. But I want to show you how to add just a “touch” of this popular style to your bathrooms. Whatever your home style, adding a farmhouse sink (HERE) to your bathroom gives the room a touch of farmhouse without going overboard. A farmhouse sink can be added to any style bathroom – modern, contemporary, traditional, or country. A wall mounted faucet (HERE) is another farmhouse touch that can be added to any style bathroom. I love this faucet, it’s so well made and we get so many compliments on it. Natural stone countertops are another great way to bring in that farmhouse element while still keeping with the style of your home. Travertine or marble with a jagged edge is a great choice. If you are looking for more than a touch, planking your walls with boards or shiplap will really give you the full on modern farmhouse style. You can read more about that HERE. Bringing in accents like lavender soap, flowers, baskets, wood tones, open shelving, and sconces with edison bulbs will add to the farmhouse atmosphere as well. Home Styling trends come and go, but if you want to add a touch of farmhouse style without breaking the bank, pick a few classic elements like the ones I mentioned and they can easily transition to another style in the future. 40% off One Item at Regular Price at HobbyLobby.com. Some exclusions apply. Thank you sweet Lynn..hugs to you!